Strong support – for women who are pregnant with multiples, are experiencing severe pregnancy back pain, or who have pre-existing back problems. Another important thing to consider is where your pain is primarily located and what is causing it. Many women suffer pain very low in the back due to hip or pelvic instability. In this case, you need to consider a belt that can be comfortably worn lower (Around your hip area) to help stabilise the pelvic region and therefore relieve your pain. In the reviews below, we have tried to provide you with a basic description of each of our pregnancy support belts, including the level of support they offer, their comfort, composition, and visibility under clothing. We have also made special note of those belts which will help with hip or pelvic instability. We have also listed the approximate heights of the belts at the back, to help you determine how high they will sit on you and how much coverage they will give your back. $0 Exchange if we recommend your size – If we recommend your support belt size and get it wrong, we will exchange the belt for free and cover the return postage costs. This belt is very simple, and at a width of only 8cm is really only designed to give a little lift to the belly or help alleviate those little back niggles. This is however a very good belt if you are suffering from pain due to hip or pelvic instability since it can be worn comfortably around the hips and the level of support can be adjusted using the two adjustable side pulls. Due to the thin streamlined design of this belt, it is practically invisible under clothing and comfortable and easy to wear. Offers light to moderate support to the hip region, or light support to the lower back. Height of belt at the back is 8cm. This pregnancy support belt is a great all round belt that is comfortable, discreet, and very supportive. If you only have mild back ache or just want a lift to your belly, then you will find the band itself very comfortable and efficient. If you have average to bad back pain, then you can attach the included side pulls and increase the level of support offered. The support that the Baby Belly band offers is definitely on par with the Gabrialla belts and given that it is only 12.5cm high, it is a great option for smaller women or for women that don’t want to feel like they are wearing a structured support belt. It is made from a neoprene fabric, which makes it very comfortable and allows it to mold really well to each woman’s particular body shape. The fabric composition and design of the belt makes it almost invisible under most clothing. If you want to feel that more of your back is supported, you may want to choose a belt with a higher back. One of the best things about this product is that it can also be worn as a hip brace, providing support for hip or pelvic instability. This can often be the cause of lower back pain, so supporting it well can make a big difference. 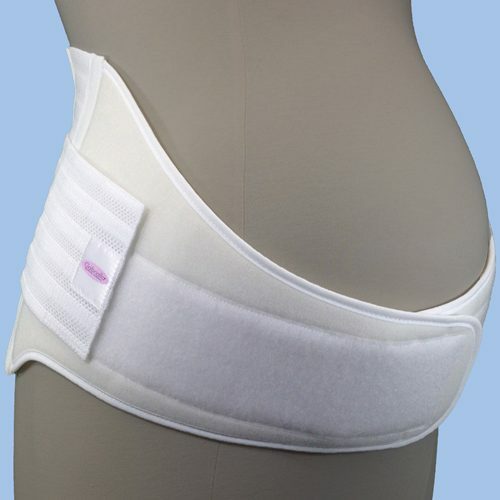 If you suffer from vulvar varicose veins you can purchase this product as the Baby Belly groin support belt, which provides you with both the back support and adjustable groin support. Alternatively, if you develop vulvar varicosities later in your pregnancy, you can purchase the groin supports separately and attach them to your band. Offers light to moderate support to the lower back region, or moderate to strong support to the hip region. Height of belt at the back is 12.5cm. This is an excellent all round support belt that will help relieve light to moderate levels of lower back or sciatic pain, commonly experienced during pregnancy. We love how discreet yet how supportive this belt is. It offers light to moderate support to the hips and back. Made out of comfortable and breathable Airlight moulded foam, this is an excellent all rounder belt for all stages of pregnancy and for women partaking in any form of activity or exercise. We love the flexibility of this belt. It can be worn three different ways depending on the wearers particular needs. It can be worn down low to provide hip, back, and bladder support. It can be safely worn around the middle to provide diastasis recti support (something very few other belts can do), or the straps can be separated to provide motion control for women who are sports enthusiasts or those women who are continuing to run through their pregnancy. This is a comfortable and customisable belt that will ensure you are well supported and that you can change the way you wear the belt should your needs change throughout your pregnancy. We love the flexibility of this splint and it's ability to support the belly in different ways according to each individuals specific needs. Offers moderate support to the lower back or hips. The FitSplint can be worn 3 ways. It can be worn to reduce general lower back or hip pain, or to reduce bladder discomfort. Can also be worn in such a way to support your belly while running/exercising, or can be worn so as to support a diastasis recti. We have stocked this belt the longest out of the range, and it has always proved to be a top seller. It is an excellent all round belt that provides great support for average to bad back pain, has adjustable side pulls which means you can get that little extra support you are looking for, and has a pocket in the back in which you can place a warm/cold compress (sold separately). This belt is a particular favorite amongst runners or sporting women since it is not overly bulky and is nice and supportive. The outer fabric of this belt is an elastic feel, and it has a cotton interior. The edges are firmer than some of the other belts, and while this helps maintain the shape and integrity of the belt, it may mean that it could ‘cut in’ for some women. With a back height of 15cm it should comfortably suit most women’s height and body shape. Being a strong elastic fabric and having Velcro closures, you will most likely notice this belt under tight fitting clothing. Offers moderate support to the lower/mid back region. Back pocket for placement of a warm/cold compress (compress NOT included). Height of belt at the back is 15cm. This belt is essentially the same as the Gabrialla Medium Support Belt (above). It offers the same level of support, adjustable side pulls, and a pocket in the back. The main difference is that it is approximately 1cm higher at the back and it is made of a different fabric composition. Instead of the solid elastic outer, it is made from breathable elastic through the back and then soft foam in the sides and front. This makes the belt less likely to ‘cut in’ and overall just that little bit more comfortable. The soft foam is a little thicker than the elastic of the Gabrialla Medium Support belt, so it is a little bulkier and it may be a little more visible under clothing (again this is only usually an issue if wearing tight fitting maternity clothes). Offers moderate support to the lower/mid back. Back pocket for placement of a warm/cold compress (compress NOT included). Height of the belt at the back is 16cm. 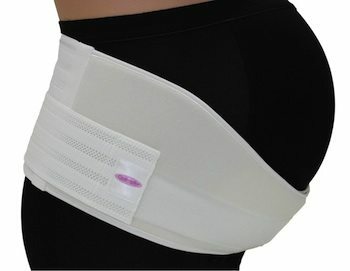 Another comfortable belt for average to bad pregnancy back pain. The Bamboo fabric outer of this pregnancy support belt makes it a lovely soft feeling belt, however, unless you plan on wearing it directly against your skin, is probably unnecessary. You also need to be careful not to catch the Velcro closure on the bamboo fabric, as it will pull the fibers very easily. The way that the back of the belt dips down to cover your lower back also feels nice. This belt has a pocket in the back and does come with an included cold/warm compress. It doesn’t have adjustable side pulls, which I personally like to have in a belt, as they can make quite a bit of difference to the support offered. The edges are quite firm which helps the belt retain it’s shape and prevent rolling, however, this may cause ‘cutting in’ issues for some women. The Velcro front closure of this belt is the main thing that may make it obvious under clothing. The Upsie Belly is also marketed as a post partum belt, however, it will never offer the same results as a belly wrap that has been specifically designed for postnatal recovery. You can spin the Upsie Belly around after the birth of your baby so as to provide some comfort and mild support to your belly, however, it will be more awkward to use and will not apply the necessary pressure in the correct places as a proper post pregnancy belly wrap. Offers moderate support to the lower/mid back region. Has a pocket for a warm/cold compress (compress included). Height of belt at the back is 21cm (some of this height is because the belt dips down to cover your lower back/tailbone). This pregnancy support belt is designed for people who are carrying multiples or who are experiencing severe pregnancy back pain. It is the biggest of our pregnancy belt range, measuring 20.5cm high at the back, and as such, can be a little cumbersome for particularly short or petite women. People who want to feel like a large portion of their back is supported will enjoy this belt. The support from a correctly fitting belt is very strong, and it also has the adjustable side pulls for extra support. The stays that are built into the belt prevent it from rolling, and it is made from the same breathable elastic and soft foam as the Gabrialla Deluxe belt, for added comfort. Again, the thicker foam sides and front in addition to the Velcro closures make this pregnancy belt more obvious under tighter clothing. This is a large, structured belt, so unless you really need something heavy duty, you will most likely find the support you need in a more comfortable option in one of the other belts. Offers strong support to the lower, mid, and upper back region. Height of the belt at back is 20.5cm.Note: The size of this belt means it can be too big and cumbersome on petite women.